I recently read R.L. Stine's The Night of the Living Dummy, and I have to say I like it! It's about two sisters named Linda and Kris Powell who share the same room. Linda finds a dummy in the trash and decides to keep it and name it Slappy. Kris gets jealous of the prize she finds and really wants her own dummy. So their dad, Mr. Powell, finds Kris her own dummy at an antique shop and brings it home. Kris decides to name it Mr. Wood. Then strange happenings begin to take place around their home. For example, Kris gets up to get a drink of water and wakes Linda up; as Linda is falling back to sleep she hears her sister scream. She dashes down the stairs and finds the refrigerator has been dumped out completely, and Mr. Wood is sitting in the middle of the mess with a piece of chicken on his lap. The two dummies are a good find in the beginning but now are starting to become a nightmare for the two sisters. It's not very scary to me and I am 8 years old but it could be a little frightening for someone younger than me. I would recommend this book for both boys and girls. If I had to rate this I would have to say: four thumbs up! It is available on paperback and in digital format. Mom here and I just finished a story I think all of you Harry Potter and Nancy Drew fans would enjoy. This is a nifty story centered around a scary house, three very curious intelligent friends, and a artefact mystery. 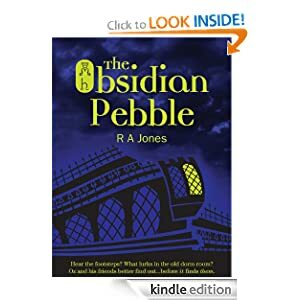 This is a story perfect for boys and girls and anyone who enjoys Nancy Drew or Hardy Boys type series. Oz Chambers is our main character that lives with his mom in the old Penwurt Orphanage that his father inherited right before he was killed in a car crash. This old building is listed as one of the "Haunted Places of Seabourne" and Oz loves living in it. The story starts out on Halloween night, which was a great idea for the author to do, because we are already waiting for something spooky to happen on All Hallow's Eve. And what happens sends Oz and his two best friends, Ellie and Ruff, on a ghost hunt; uncovering history and clues that bring them more closer to finding out why Penhurt is the way it is. This story has a few similarities to the Harry Potter Series, but not in a bad way. Mainly just the close relationship the three friends have as well as Ellie being the smart independent girl, Ruff is really funny and smart in his own way, and Oz is the one the story is centered around. Except this story is more modern-they talk about video games, cell phones, and the internet. I feel like the target audience can appreciate the similarities but also look forward to the direction this story takes. I know my 8 year old twins would love this book, and I would definitely recommend this novel as a reading project for a family. There is also a lot of English slang in this book, but most of it was pretty easy to figure out using context clues. I especially enjoyed Ruff's favorite word "buzzard", which he uses to describe every emotion he ever feels. I believe there is enough action to keep one interested but not overly too much of it to make the story become distracting.